Figure 2. In situ localization of cellulose and noncellulosic polysaccharides in medial longitudinal sections of 3-h-imbibed Arabidopsis seeds. A and B, Whole seed sections labeled with the probes CBM3a and Calcofluor White. CBM3a binding revealed cellulose in all cell walls. 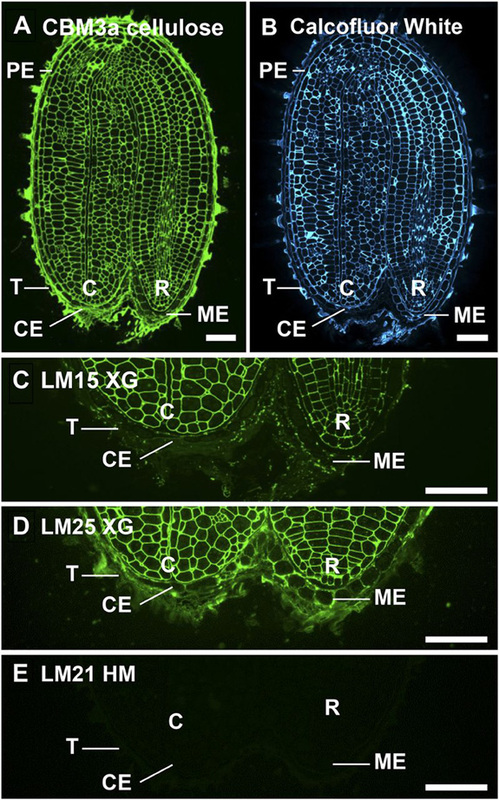 C to E, ME and CE seed regions labeled with probes LM15 XG, LM25 XG, and LM21 HM. LM15 XG was detectable in embryo but not endosperm cell walls, whereas LM25 XG was detectable in testa, endosperm, and embryo cell walls. No heteromannan (HM) was detectable in the seed. C, Cotyledons; R, radicle; T, testa. Bars = 50 mm.